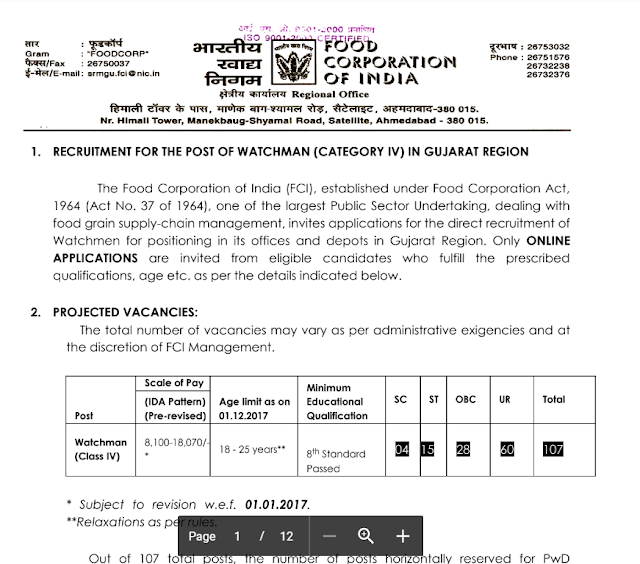 FCI Gujrat Recruitment for Watchman post - Check here online complete details. The Food Corporation of India (FCI), established under Food Corporation Act, 1964 (Act No. 37 of 1964), one of the largest Public Sector Undertaking, dealing with food grain supply-chain management, invites applications for the direct recruitment of Watchmen for positioning in its offices and depots in Gujarat Region. Only ONLINE APPLICATIONS are invited from eligible candidates who fulfill the prescribed qualifications, age etc. as per the details indicated below. negative marking on each wrong answer. 800 Meters in 04 Min.30 Sec. FCI reserves the right to introduce additional phase of written examination/screening test in compelling circumstances for screened candidates on the basis of performance in Written Test and decision regarding calling such number of candidates shall be decided by FCI only. The number of candidates shortlisted for Physical Endurance Test will be in the ratio of 1:3. The venue of the Endurance Test will be informed through website www.fcijobportalgujarat.com. The candidates are advised to keep visiting the website regularly. Physical Endurance Test (PET) is of qualifying nature only. The final merit list will be decided on the basis of Written Test subject to qualifying the Physical Endurance Test. Only those candidates who are qualified in the Physical Endurance Test will be considered for final selection. along with eye/vision test to attend the endurance test without which the candidature shall be liable to be cancelled.